The Former Origin Greats (FOGS) remain committed to endorsing and participating in reconciliation through our various programs and initiatives by launching our first Reconciliation Action Plan (RAP) – an Innovate RAP, endorsed by Reconciliation Australia. 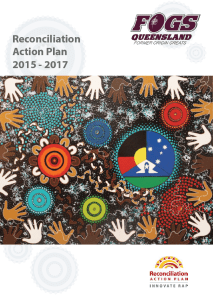 The development and publication of our RAP has stipulated comprehensively our responsibilities and further enforces our genuine commitment to improve outcomes for Aboriginal and Torres Strait Islander Peoples. We are proud of the continued initiatives and programs that our organisation coordinates and facilitates both within schools and in the community. The FOGS have a proud history of Aboriginal and Torres Strait Islander members, whom have all contributed significantly to Queensland’s success at State of Origin level and who assist through providing support to our programs. The FOGS acknowledge Reconciliation Australia and its continuing role within the community, providing education and promoting the importance of reconciliation between Aboriginal and Torres Strait Islander Peoples and other Australians.